Name of a treatise in the Mishnah and in the Tosefta, as well as in the Babylonian and Jerusalem Talmuds. It is the tenth treatise in the mishnaic order Mo'ed, and includes four chapters, containing thirty-three paragraphs in all. Ch. i. 1-4 treats of the portion of the month Adar in which the Megillah is to be read, and, in case of a leap-year containing two months of Adar, it designates which month is to be chosen. The 15th of Adar, or in a leap-year the same day of the second Adar, is the day appointed for walled cities, and the 14th of Adar for unwalled cities and for villages. The inhabitants of the latter, however, when livingin districts where they meet weekly in the neighboring city, may read the roll on the 13th, 12th, or 11th of Adar, if the gathering takes place on one of these days. Since this distinction is made between the two months of Adar of a leap-year, while both months are alike in all other respects, ch. i. 5-11 notes several other groups of objects and cases which differ from one another in one point only; one such group, e.g., consists of the sacred books, the tefillin, and the mezuzah, the first two of which may be written in any language and script, but the last only in Hebrew and in square script. Greek is given the preference over all other foreign languages, since, according to R. Gamaliel, even the sacred books may be written in it. Ch. ii. 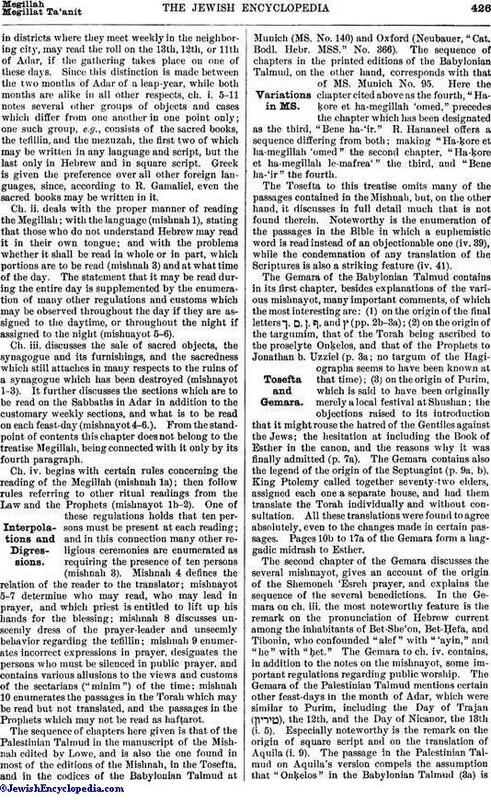 deals with the proper manner of reading the Megillah; with the language (mishnah 1), stating that those who do not understand Hebrew may read it in their own tongue; and with the problems whether it shall be read in whole or in part, which portions are to be read (mishnah 3) and at what time of the day. The statement that it may be read during the entire day is supplemented by the enumeration of many other regulations and customs which may be observed throughout the day if they are assigned to the daytime, or throughout the night if assigned to the night (mishnayot 5-6). Ch. iii. discusses the sale of sacred objects, the synagogue and its furnishings, and the sacredness which still attaches in many respects to the ruins of a synagogue which has been destroyed (mishnayot 1-3). It further discusses the sections which are to be read on the Sabbaths in Adar in addition to the customary weekly sections, and what is to be read on each feast-day (mishnayot 4-6.). 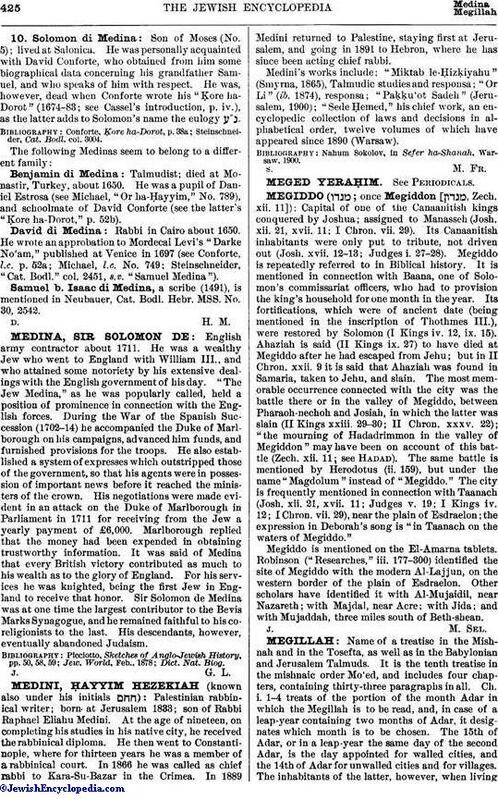 From the stand-point of contents this chapter does not belong to the treatise Megillah, being connected with it only by its fourth paragraph. Ch. iv. begins with certain rules concerning the reading of the Megillah (mishnah 1a); then follow rules referring to other ritual readings from the Law and the Prophets (mishnayot 1b-2). One of these regulations holds that ten persons must be present at each reading; and in this connection many other religious ceremonies are enumerated as requiring the presence of ten persons (mishnah 3). 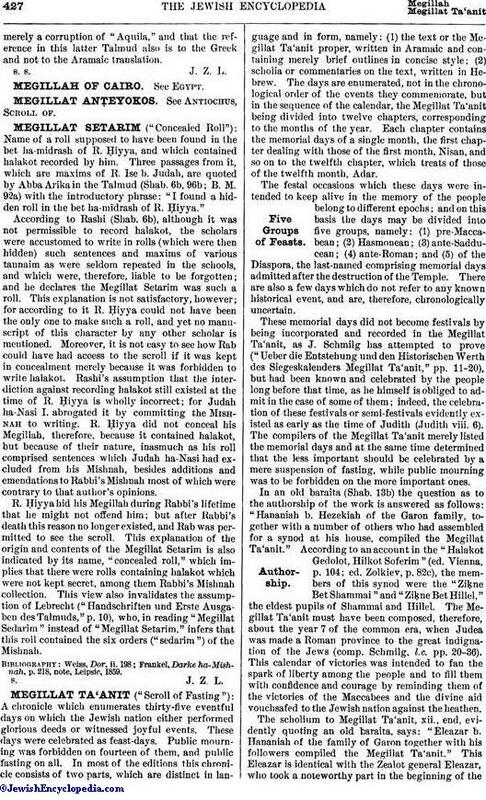 Mishnah 4 defines the relation of the reader to the translator; mishnayot 5-7 determine who may read, who may lead in prayer, and which priest is entitled to lift up his hands for the blessing; mishnah 8 discusses unseemly dress of the prayer-leader and unseemly behavior regarding the tefillin; mishnah 9 enumerates incorrect expressions in prayer, designates the persons who must be silenced in public prayer, and contains various allusions to the views and customs of the sectarians ("minim") of the time; mishnah 10 enumerates the passages in the Torah which may be read but not translated, and the passages in the Prophets which may not be read as hafṭarot. The sequence of chapters here given is that of the Palestinian Talmud in the manuscript of the Mishnah edited by Lowe, and is also the one found in most of the editions of the Mishnah, in the Tosefta, and in the codices of the Babylonian Talmud at Munich (MS. No. 140) and Oxford (Neubauer, "Cat. Bodl. Hebr. MSS." No. 366). The sequence of chapters in the printed editions of the Babylonian Talmud, on the other hand, corresponds with that of MS. Munich No. 95. Here the chapter cited above as the fourth, "Haḳore et ha-megillah 'omed," precedes the chapter which has been designated as the third, "Bene ha-'ir." R. Hananeel offers a sequence differing from both; making "Ha-ḳore et ha-megillah 'omed" the second chapter, "Ha-ḳore et ha-megillah le-mafrea'" the third, and "Bene ha-'ir" the fourth. The Tosefta to this treatise omits many of the passages contained in the Mishnah, but, on the other hand, it discusses in full detail much that is not found therein. Noteworthy is the enumeration of the passages in the Bible in which a euphemistic word is read instead of an objectionable one (iv. 39), while the condemnation of any translation of the Scriptures is also a striking feature (iv. 41). The Gemara of the Babylonian Talmud contains in its first chapter, besides explanations of the various mishnayot, many important comments, of which the most interesting are: (1) on the origin of the final letters ך, ם, ן, ף and ץ (pp. 2b-3a); (2) on the origin of the targumim, that of the Torah being ascribed to the proselyte Onḳelos, and that of the Prophets to Jonathan b. Uzziel (p. 3a; no targum of the Hagiographa seems to have been known at that time); (3) on the origin of Purim, which is said to have been originally merely a local festival at Shushan; the objections raised to its introduction that it might rouse the hatred of the Gentiles against the Jews; the hesitation at including the Book of Esther in the canon, and the reasons why it was finally admitted (p. 7a). The Gemara contains also the legend of the origin of the Septuagint (p. 9a, b). King Ptolemy called together seventy-two elders, assigned each one a separate house, and had them translate the Torah individually and without consultation. All these translations were found to agree absolutely, even to the changes made in certain passages. Pages 10b to 17a of the Gemara form a haggadic midrash to Esther. The second chapter of the Gemara discusses the several mishnayot, gives an account of the origin of the Shemoneh 'Esreh prayer, and explains the sequence of the several benedictions. In the Gemara on ch. iii. the most noteworthy feature is the remark on the pronunciation of Hebrew current among the inhabitants of Bet-She'on, Bet-Ḥefa, and Tibonin, who confounded "alef" with "'ayin," and "he" with "ḥet." The Gemara to ch. iv. contains, in addition to the notes on the mishnayot, some important regulations regarding public worship. The Gemara of the Palestinian Talmud mentions certain other feast-days in the month of Adar, which were similar to Purim, including the Day of Trajan ( ), the 12th, and the Day of Nicanor, the 13th (i. 5). Especially noteworthy is the remark on the origin of square script and on the translation of Aquila (i. 9). The passage in the Palestinian Talmud on Aquila's version compels the assumption that "Onḳelos" in the Babylonian Talmud (3a) ismerely a corruption of "Aquila," and that the reference in this latter Talmud also is to the Greek and not to the Aramaic translation. S. S. J. Z. L.